A Road Less Traveled: Hello Blogging World! I'm back! And in full force, being as how I just made a commitment to my sisters to blog 5 x per week for the next two months. We decided we needed to set some goals for ourselves and I knew that blogging needed to be one of mine, being as how my kids are constantly asking when I am going to blog again! The bad thing about starting back up on something you've neglected so long is that there is SO much to write about and it's a bit overwhelming. I'm so excited to share about our family reunions, trip to New York, and tons of other things. But for today, I am going to focus on our sweet Conner. Conner is really suffering right now. I think the newness and excitement of being in America has worn off and he is homesick. But his biggest struggle he is facing is learning English. Having two sisters that are fluent in Mandarin has been wonderful and beneficial in so many ways. I would choose it again and again and it his made him feel comfortable in our family. At the same time, I think it has really hindered his ability to learn English. He is very close to his sisters and spends lots of time with them and with his "Mandarin speaking" iPod. 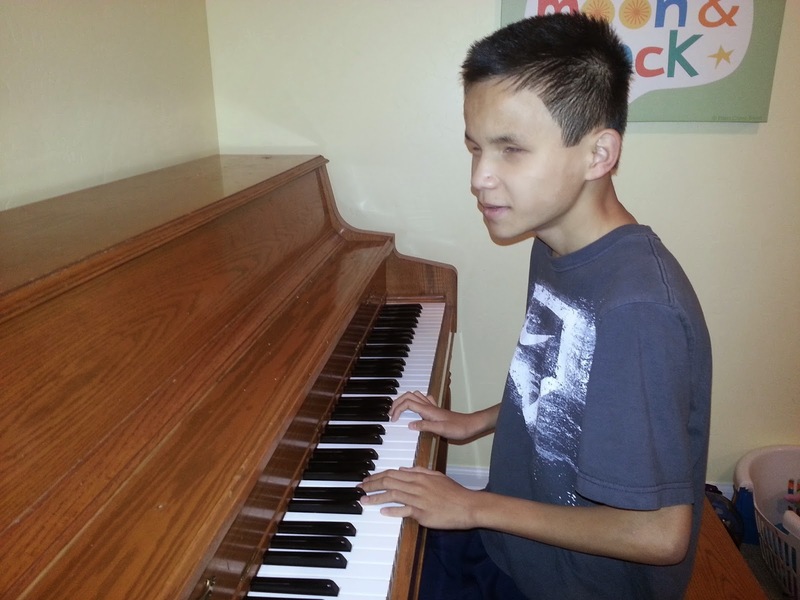 Because Conner is blind, there are many activities that just don't appeal to him-- especially when he can't communicate well. So it's easy to let him spend hours listening to Chinese books or his iPod, even when we know that he needs to be using English. We thought that school would be a good way for him to have to buckle down and focus on English. And it probably is. Which is probably why he pretty much hates it. He goes without a fight, but when asked how his day went, it is always "no good." (Though he does light up when he tells us about sitting by girls at lunch! LOL) He says that he doesn't understand anything and everyone talks so fast and that he isn't learning anything. He desperately misses his school in China, where he was popular, excelled in everything, and got to spend a lot of time on the computer. His school recently hired a para (aide) for him and we are hoping it will be a tremendous help. His para served a mission in Taiwan and speaks Chinese, though Conner claims he only speaks "a little" Chinese. (; Honestly, it is probably just as well that he isn't as fluent as Conner wants so it can force Conner to work harder at English. But the bottom line is, Conner is pretty depressed right now. He loves us (there is no shortage of hugs and "I love yous" and all kinds of warmth from him) and is so happy to have a family. Those feelings are genuine and we know that in many senses he is more happy than he has ever been. It is almost breathtaking how much he loves us and how well he shows it. At the same time, he is really grieving the relative ease of his former life. I keep thinking of sending Parker or Taylor to China at their ages and expecting them to adjust and go to school and love it-- it would be pretty impossible for a long, long time. And I just read that many times for older adoptees, the hardest time is between months 5-9. Bummer! The good news is that we know there is a light at the end of the tunnel. We remember Graci and Cali going through these same things and see how absolutely well-adjusted and happy they are now. We know that this is mostly a language issue. But for some reason, for Conner it seems more pronounced. Perhaps it's because his world is already dark that adding any burdens to it just feels awful. Many things that the girls found joy in (watching movies, playing games, doing activities, etc) don't hold the same joy for him right now. When you are blind, so much of your life revolves around talking to people. Lexi LOVES people and loves to talk and talk and talk. She loves to have things described to her and loves to converse about many topics. When your world is dark, conversation is what lights it up. Conner is like that too-- but is so hindered by language that he is lonely and frustrated. One thing that Conner has been able to find joy in is learning about Jesus Christ. 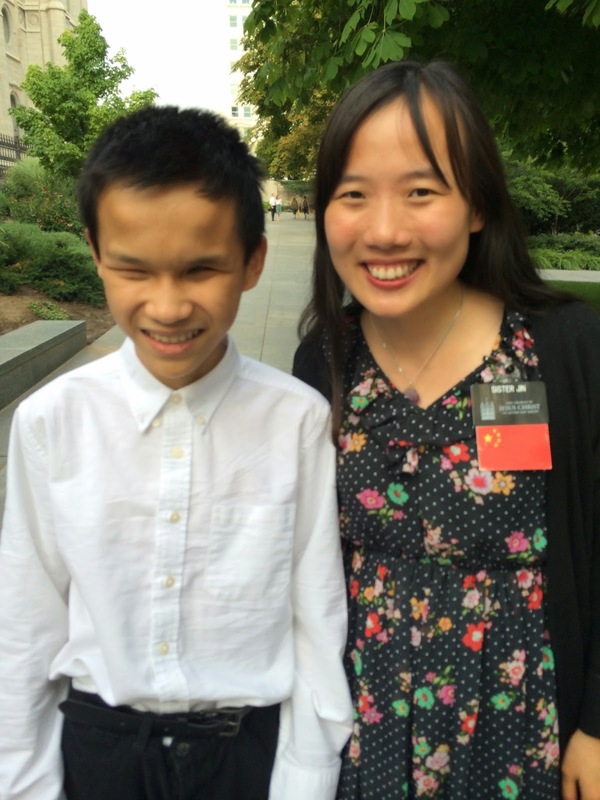 We have been taking him up to Temple Square so that he can be taught by Mandarin speaking missionaries. He has fallen in love with Sister Jin. She is a very special person who just radiates the love of Christ. Watching him learn about the gospel has been a beautiful experience. When asked a couple of weeks ago if he wanted to be baptized, he said in Chinese "Yes. As soon as possible, please." So this Saturday morning he will be baptized a member of the Church of Jesus Christ of Latter Day Saints. He will also receive the priesthood and that afternoon, will be sealed to our family in the Salt Lake Temple. We are so excited for Conner and for the blessings we know will come from his decision. He is such a good, good young man who desires to follow Jesus Christ and be like Him. I wish I could be there! I'm so sad to have my plans thwarted. I love you, Conner! Prayers for Conner!!!!! We loved him instantly!!!!! This post is signed "Jeremy" but I'm hearing Christi's voice in there. ;) If it's you, Christi, welcome back! I've missed your blog posts. We will add Conner to our prayers. Our hearts will be with all of you this weekend as you add another family member to the church and your eternal circle. Wish with all my heart that I could be there. Love you! Five times per week she promised us. So now I have to make a fuss. A week has passed with only two. Another week is almost through. You'd think you had 10 kids, you know. That make your blogging efforts slow. I will not judge. I understand. But you better get your blog in hand! Teasing, of course...and I only tease because I love this blog so much! !